If you are looking to relocate in the Kansas City Metro area, you would be remiss not to consider the impressive real estate options in Lee’s Summit, Missouri. Lee’s Summit is a truly remarkable place and was ranked among Missouri’s “Top 10 Happiest Places,” in addition to making Money Magazine’s list of the “Top 100 Best Cities to Live in in the United States.” For years Lee’s Summit has been a popular destination among prospective homebuyers looking for a quiet, charming hometown with easy access to the excitement of the city. 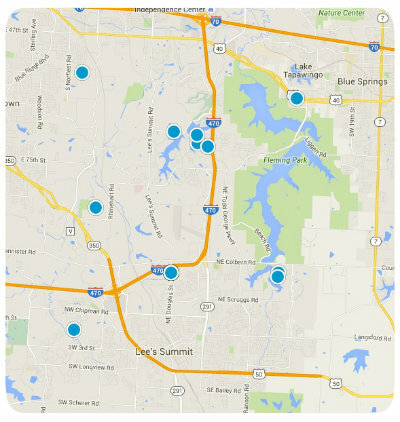 Despite its consistent popularity, Lee’s Summit has many affordable real estate options within its numerous luxurious communities. Monarch View is a great example. Monarch View is a beautiful subdivision located approximately four miles south of the Summit Woods shopping area in southwest Lee’s Summit. Home to 258 lots, Monarch View affords its residents top-notch shared amenities including two stocked fishing ponds, multiple walking trails and a 24 acre nature park. Monarch View also has a six lane competitive swimming pool, a side pool and baby splash pool, all of which overlook an expansive playground and glistening lake. Monarch View is a great place to raise a family and neighborhood schools include: Hawthorn Hill Elementary, Lee’s Summit Christian Academy Elementary, Summit Christian Academy Junior/Senior High & Preschool, Our Lady of Presentation School, Summit Lakes Middle and Lee’s Summit West High schools. Homes for sale in Monarch View vary in price depending upon the property’s architectural style, its age, size, location with the community, and its special features. If you would like to buy a home in Monarch View of Lee’s Summit, or you have questions regarding homes for sale in other Lee’s Summit communities, please do not hesitate to contact us today for more information. Courtesy of Hub Realty, Inc. Listing courtesy of Danny Conway of Hub Realty, Inc..